Punt e Mes is an amaro-red (sweet) vermouth hybrid made by Carpano and the name means “point and a half” in the dialect from Turin. The legend goes that a man ordered a glass of red vermouth and half dose of bitters and Antonio Carpano’s bar. Punt e Mes is made with a variation of herbs and spices and has a base of white wine. Punt e Mes has a bitter component and is not as smooth or velvety as, say, Carpano Antica Formula red vermouth. 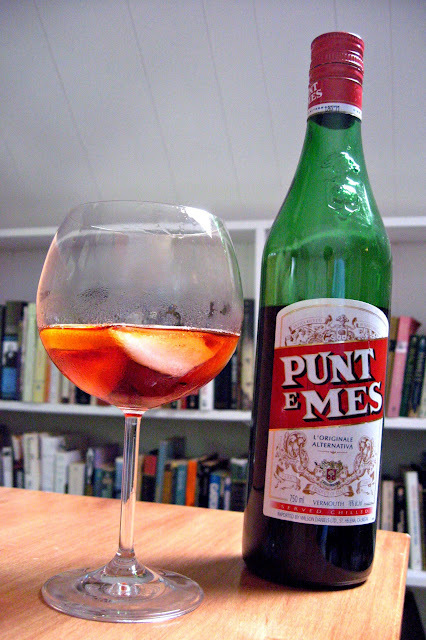 I like to serve Punt e Mes with Campari and some soda water for a slight twist on the Americano or straight up with a few ice cubes and an orange slice. If you’re looking for an excellent price on Punt e Mes order it from WineChateau for only $19.39.